As mooted here, I’m in Orange at the moment as part of the 20th birthday of the region. While it has been less than three years since my last visit, plenty has changed, with a whole host of vineyards changing hands, changing names or just changing. Landing here at vintage time is a massive bonus, as nothing beats the information you can get by tasting grapes and then seeing the finished product – a proper connection between fruit and finished product (plus wine grapes are shitloads tastier than most table grapes). 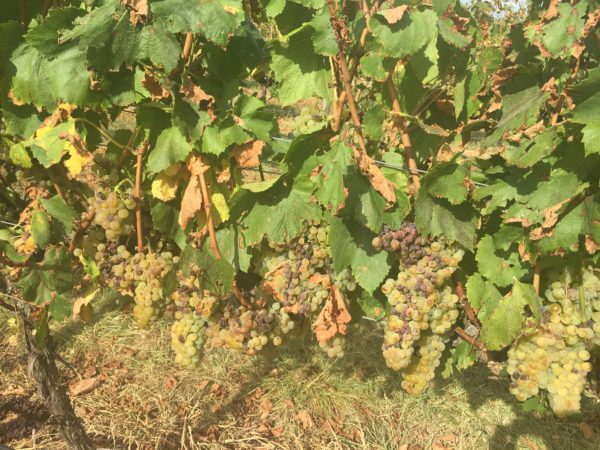 Speaking of harvest, 2016 will go down as a cliched ‘vintage of two halves’, with January very wet and humid, followed by the last 6 weeks which have been very dry and warm. While that meant early season disease pressure, all that dry warmth has delivered what will ultimately go down as a dry, warm and bloody early vintage, with many vignerons already finishing their harvest. Just to illustrate how irrelevant such generalisations can be, however, Philip Shaw will have fruit coming in right through until April, with a little rain this week extending their vintage until into ‘late’ territory. Still, this will be a strong year for most Orange vignerons, with many bullish about the vintage even though it was so early (for most). It’s too early to see how that fleshes out, but expect some riper styles this year – which is not such a big problem in a region as cool as Orange. We spent a few solid hours today out in the vineyards, which was a typically intriguing reminder of how tricky grape growing is. That’s Chardonnay at the famed Balmoral Vineyard, which was once the source of Rosemount’s super premium Orange vineyard wines. See the brown, shrivelled berries in amongst the bunches? That’s the after-effect of a hailstorm in late January. Super localised, it hit Balmoral hard, with some vines suffering extensive damage. It was still early in the season though so any damaged berries just shrivelled up and died without significant disease issues. It did slow down the ripening though, which is why these meagre crops are only being picked tomorrow, despite most other vineyard’s Chardonnay being picked by now.